The functional materials and materials chemistry group - or FACET for short - has a wide range of research interests, from practical application in the aluminium industry, to the impact of individual atoms on the properties and functionality of materials. The complementary research fields are covered by different professors and their teams. As such, FACET is optimised to address the complex challenges of modern materials science and chemistry. The FACET group is headed by Professor Mari-Ann Einarsrud and brings together leading expertise: in computational analysis, state of the art syntheses and advanced characterisation. The friendly and collaborative international atmosphere within FACET, is actively fostered by all members with initiatives like join social events ranging from hytte trips, to climbing excursions, and BBQing. 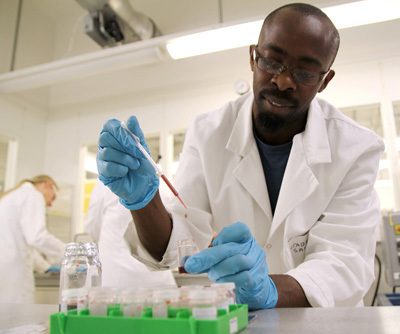 Thus FACET provides a unique and ambitious research environment for students and scientists alike. Please click on one of the icons below to find out about what each of our teams specialises in. The researchers are in the team that reflects their main project work but most researchers assist in multiple teams; helping where ever their skill set is required. For a full list of an researcher’s research, please go to their personal page by clicking on their picture. Aside from our close collaborations with NTNU nanoLab and the TEM centre. 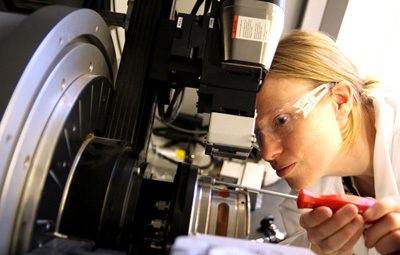 The group is running state-of-the art laboratories for materials synthesis and characterisation. More information on the specific instruments used for the various types of analysis and characterization here. A wide variety of furnaces for material synthesis and conditioning are available, ranging from traditional furnaces up to 1800 oC with ambient atmosphere to controlled atmospheres (oxidising, reducing and inert) up to 1600 oC. A hot press is available up to 2500 oC and a new unit for spark plasma sintering (SPS) is operative. Particle size distribution analysis can be conducted based on laser diffraction ranging from 0.01 to 5000 mm. A combination instrument enables the assessment of surface area (BET), temperature programmed reduction (TPR) and desorption (TPD). Density measurements can be conducted by Archimedes and He-pyknometer. For the analysis of e.g. sintering characteristics or phase transitions up to 1650 oC the laboratories are equipped with several TGA/DTA/DSC instruments in combination with a mass spectrometer (MS). 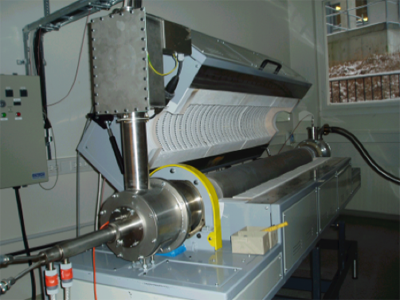 One DSC instrument is dedicated for experiments from cryogenic to 1000 K. Dilatometers cover both intermediate (1600 oC) and high temperatures (2000 oC). Thermal diffusivity and conductivity can be measured by laser flash up to 1200 oC. Preparing for high temperature TGA/DTA analysis of a ceramic sample. Furnace units for assessment of electronic/ionic conductivity, impedance spectroscopy (IS) as well as dielectric characterization up to 1200 oC in controlled atmosphere are available. Piezoelectric properties can be determined on bulk materials and thin films. Three different electrochemical test stations for charge/discharge characterization of batteries, with a total of 80 test channels. 8 test channels are available for controlled atmosphere from -20 to 100 °C. Additionally, there is equipment available for ac impedance spectroscopy and cyclic voltammetry analysis, and new laboratory for scanning probe microscopy (SPM). Fully equipped laboratories including light- and electron-microscopes (SEM/EDS), X-ray diffraction (XRD) at ambient conditions as well as high temperatures and controlled atmosphere (HTXRD). Atomic force microscopes (AFM/STM) and IR-UV spectroscopy are available. Our XRD-lab. is a partner in the Norwegian Centre for X-ray Diffraction, Scattering and Imaging (RECX). An apparatus for 4-point bending and creep tests in controlled atmospheres up to 1100 oC is available along with a ball-on-ring apparatus for testing brittle materials at ambient conditions. Hardness and fracture toughness are assessed by Vickers while surface hardness also may be measured by a dedicated instrument performing scratch testing. Software for density functional theory (DFT: VASP, Quantum Espresso), molecular dynamics (MD, Lammps), finite element method (FEM, COMSOL) and thermodynamic calculations (Factsage). Computational resources provided by Sigma2. 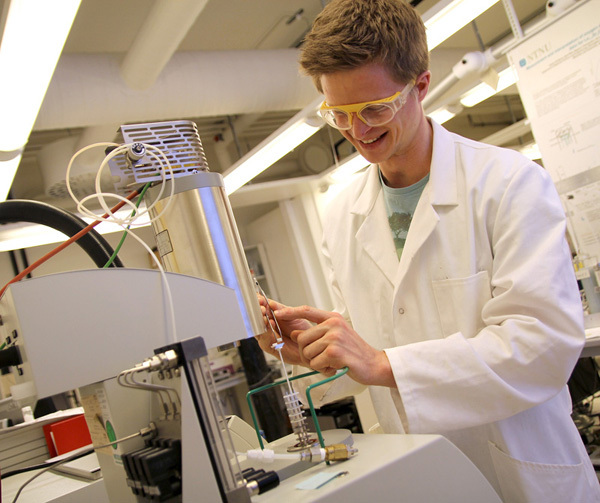 Access to infrastructure and facilities provided by NTNU-NANO-lab clean rooms, NORFAB, RECX and NORTEM. We also make regular use of ESRF and other synchrotrons and neutron sources. J. Mater. Chem. A 7 (2019) 3848-3856. J. Mater. Chem. A (2019). Solid State Ionics 320 (2019) 215-220. J. Phys. : Condens. Matter 31 (2019) 155401. Metall. Mater. Trans. B 50 (2019) 950-957. J. Eur. Ceram. Soc. 39 (2019) 1237-1244. Metall. Mater. Trans. B 50 (2019) 242-250. Fluid Phase Equilib. 486 (2019) 21-36. R. Soc. Open Sci. 6 (2019) 180989. J. Power Sources 410–411 (2019) 143–151. Int. J. Appl. Ceram. Technol. 16 (2018) 602-613. J. Appl. Phys. 124 (2018) 185301. Phys. Rev. B 98 (2018) 184102. Phys. Rev. Materials 2 (2018) 114405. AIP Advances 8 (2018) 105228. Appl. Surf. Sci. 459 (2018) 822-829. CrystEngComm. 20 (2018) 6795 – 6802. Nature Nanotechnol. 13 (2018) 1028–1034. R. Soc. open sci. 5 (2018) 180368. ACS Nano 12 (2018) 2998–3009. Chem. Mater. 30 (2018) 2631–2640. Emerging Applications of Nanoparticles and Architecture Nanostructures, Ch.18 (2018) 553-574. Cryst. Growth Des. 18 (2018) 770–774. J. Eur. Ceram. Soc. 38 (2018) 1592–1599. Nature Phys. 14 (2018) 465–468. Phys. Rev. B 97 (2018) 085143. Phys. Chem. Chem. Phys. 20 (2018) 2754-2760. Nano Lett. 18 (2018) 763-772. Scr. Mater. 145 (2018) 122-125. Ceram. Int. 44 (2018) 1526-1533. J. Mater. Sci. 53 (2018) 1672–1679. Phys. Rev. Materials 2 (2018) 014404. J. Eur. Ceram. Soc. 38 (2018) 665-670. Mol. Simul. 44 (2018) 599-612. J. Power Sources 372 (2017) 145-156. AIP Adv. 7 (2017) 115024. Sol. Energy 150 (2017) 335-344. Phys. Rev. B 96 (2017) 094109. Nano Lett. 17 (2017) 5883-5890. Phys. J. 9 (2017) 55. Chem. Mater. 29 (2017) 6367–6377. Materials Today Physics 1 (2017) 14-23. J. Mater. Chem. A 5 (2017) 18148-18156 . Microsc. Microanal. 23 (2017) 1636-1637. APL Mater. 5 (2017) 086107. Chem. Mater. 29 (2017) 6414–6424. Phys. Chem. Chem. Phys. 19 (2017) 21878-21886 . J. Phys. Chem. C 121 (2017) 15456–15462. J. Power Sources 354 (2017) 57-67. Sci. Rep. 7 (2017) 4386. J. Phys. Chem. C 121 (2017) 11897–11906. J. Am. Ceram. Soc. 100 (2017) 3835-3842. Nature Mater. 16 (2017) 622-627. Ceram. Int. 43 (2017) 9092-9098. Chem. Mater. 29 (2017) 4244-4252. Phys. Chem. Chem. Phys. 19 (2017) 9016-9027. Phys. Chem. Chem. Phys. 19 (2017) 9232-9245. J. Solid State Chem. 250 (2017) 75-82. Chem. Mater. 29 (2017) 2425-2434. J. Mater. Chem. A 5 (2017) 5846-5857. Phys. Rev. B 95 (2017) 064109. Thin Solid Films 626 (2017) 94-103. Solid State Ionics 301 (2017) 53-58. J. Sol-Gel Sci. Technol. 81 (2017) 311. Beilstein J. Nanotechnol. 8 (2017) 304-312. Phys. Rev. Lett. 118 (2017) 036803. J. Am. Ceram. Soc. 100 (2017) 354-364. Solid State Ionics 300 (2017) 106-117. ACS Appl. Mater. Interfaces 8 (2016) 33121-33130. Phys. Rev. B 94 (2016) 201115(R). Nature Commun. 7 (2016) 13745. Metall. Mater. Trans. A 47 (2016) 4721–4731. J. Am. Ceram. Soc. 99 (2016) 3685-3695. Dalton Trans. 45 (2016) 15290-15293. Nature Photon. 10 (2016) 653-656. J. Appl. Phys. 120 (2016) 064103. Nature Commun. 7 (2016) 12430. Sci. Rep. 6 (2016) 28742. Handbook of Sol-Gel Science and Technology, Springer, (2016) 1-30. J. Am. Ceram. Soc. 99 (2016) 2801-2808. Energy Harvesting and Systems 3 (2016) 213-222. J. Porous Mater. 23 (2016) 905-910. Solid State Ionics 292 (2016) 38-44. J. Schaab, I. P. Krug, H. Dogonay, J. Hackl, D. M. Gottlob, M. I. Khan, S. Nemsak, L. Maurel, E. Langenberg, P. A. Algarabel, J. A. Pardo, C. M. Schneider and D. Meier. Phys. Rev. Applied 5 (2016) 054009. Nano Lett. 16 (2016) 3390-3398. Phys. Rev. B 93 (2016) 180101(R). J. Power Sources 317 (2016) 177-183. Transl. Mater. Res. 3 (2016) 025001. J. Phys. Chem. C 120 (2016) 8959-8968. Thin Solid Films 603 (2016) 126-133. J. Eur. Ceram. Soc. 36 (2016) 1427-1434. Wavelength and orientation dependent capture of light by diatom frustule nanostructures. Sci. Rep. 5 (2015) 17403. Nature Phys. 11 (2015) 1070-1073. Phys. Chem. Chem. Phys. 17 (2015) 30343-30351. J. Appl. Phys. 118 (2015) 164104. Dalton. Trans. 44 (2015) 10875-10881. Dalton Trans. 44 (2015) 10834-10846. Energy Harvesting and Systems 2 (2015) 63-71. J. Appl. Phys. 117 (2015) 194101. ECS Trans. 64 (2015) 33-45. Solid State Ionics 276 (2015) 26-32. Phys. Chem. Chem. Phys. 17 (2015) 9420-9428. Optics Letters 40 (2015) 740-743. Zh. Wang, A. P. Ratvik, T. Grande and S. M. Selbach. RSC Adv. 5 (2015) 15985-15992. Appl. Phys. Lett. 106 (2015) 041604. J. Eur. Ceram. Soc. 35 (2015) 309-315. J. Eur. Ceram. Soc. 35 (2015) 1449-1457. J. Am. Ceram. Soc. 97 (2014) 3818-3825. J. Appl. Phys. 116 (2014) 214101. Thin Solid Films 573 (2014) 48-55. J. Appl. Phys. 116 (2014) 134102. Inorg. Chem. 53 (2014) 9715-9721. J. Am. Ceram. Soc. 97 (2014) 2928-2935. J. Eur. Ceram. Soc. 34 (2014) 3783-3790. J. Am. Ceram. Soc. 97 (2014) 2654–2661. ECS Trans. 58 (2014) 145-171. Solid State Ionics 262 (2014) 337–339. Dalton Trans. 43 (2014) 9620-9632. Appl. Phys. Lett. 104 (2014) 122905. Chem. Soc. Rev. 43 (2014) 2187-2199. J. Appl. Phys. 115 (2014) 044104. J. Am. Ceram. Soc. 97 (2014) 220-227. Colloids and Surfaces A: Physicochem. Eng. Aspects 443 (2014) 384-390. Dalton Trans. 43 (2014) 2127-2133. Surface and Coatings Technology 238 (2014) 1-8. J. Electrochem. Soc. 161 (2014) F176-F184. Zh. Wang, S. M. Selbach and T. Grande. RSC Adv. 4 (2014) 4069 – 4079. J. Electrochem. Soc. 160 (2013) F1282-F1292. ECS Trans. 57 (2013) 635-642. Solid State Ionics 249-250 (2013) 105-11. J. Energy Chem. 22 (2013) 78–86. J. Eur. Ceram. Soc. 33 (2013) 2731–2743. Phys. Rev. B 88 (2013) 054111. Chem. Mater. 25 (2013) 3296–3306. MRS Proc. Vol. 1509 (2013). Surf. Coat. Technol. 227 (2013) 10-14. J. Power Sources 238 (2013) 478–484. Chem. Mater. 25 (2013) 927-934. Surf. Coat. Technol. 221 (2013) 53-58. J. Mater. Chem. A 1 (2013) 3757-3767. J. Power Sources 235 (2013) 234. J. Am. Ceram. Soc. 96 (2013) 420. Int. J. Hydrogen Energy 38 (2013) 3087. Adv. Funct. Mater. 23 (2013) 683. Dalton Trans. 42 (2013) 2700. Dalton Trans. 42 (2013) 2704. J. Eur. Ceram. Soc. 33 (2013) 565–574. J. Eur. Ceram. Soc. 33 (2013) 1-6. J. Appl. Phys. 113 (2013) 014103. ECS Trans. 41 (2012) 1-6. Appl. Phys. Lett. 101 (2012) 252904. J. Am. Ceram. Soc. 95 (2012) 3403-3407. Solid State Ionics 225 (2012) 585-589. Solid State Ionics 225 (2012) 186-189. J. Phys. Chem. C 116 (2012) 20368. J. Solid State Chem. 196 (2012) 528-535. J. Solid State Chem. 196 (2012) 249-254. Phys. Rev. B 86 (2012) 094101. J. Membr. Sci. 415-416 (2012) 878-885. Int. J. Hydrogen Energy 37 (2012) 8017–8026. J. Solid State Chem. 192 (2012) 246-254. J. Eur. Ceram. Soc. 32 (2012) 649-655. J. Cluster Sci. 23 (2012) 421-435. J. Sol-Gel. Sci. Techn. 62 (2012) 460-469. Int. J. Hydrogen Energy 37 (2012) 8056–8061. J. Am. Ceram. Soc. 95 (2012) 1563-1571. J. Am. Ceram. Soc. 95 (2012) 730-738. Metallurg. Mater. Trans. B 43 (2012) 290-301. Chem. Mater. 24 (2012) 338-345.
in Solid State Electrochemistry II: Electrodes, Interfaces and Ceramic Membranes, First Edition (ed V. V. Kharton), Wiley-VCH Verlag GmbH & Co. KGaA, Weinheim, Germany. J. Am. Ceram. Soc. 94 (2011) 4256-4262. Solid State Ionics 202 (2011) 6-13. Topics in Catalysis 54 (2011) 1009-1015. J. Phys. Chem. C 115 (2011) 19260-19268. Adv. Mater. 23 (2011) 4007-4034. Dalton Trans. 40 (2011) 7583. J. Appl. Phys. 109 (2011) 123503. Micropor. Mesopor. Mater. 141 (2011) 146-156. Appl. Phys. Lett. 98 (2011) 091912. Cryst. Eng. Comm. 13 (2011) 1350-1359. Cryst. Eng. Comm. 13 (2011) 1304-1313. Fuel Cells 11 (2011) 17-25. Solid State Ionics 182 (2011) 32-40. J. Eur. Ceram. Soc. 31 (2011) 291-298. J. Appl. Phys. 108 (2010) 124320. Phys. Rev. Lett. 105 (2010) 185501. J. Mater. Res. 25 (2010) 1784-1792. Solid State Ionics 181 (2010) 267-275. Phys. Rev. B 82 (2010) 064102. Acta Biomater. 6 (2010) 3665-3675. J. Solid State Chem. 183 (2010) 1205-1208. J. Sol-Gel Sci. Technol. 54 (2010) 249-257. J. Eur. Ceram. Soc. 30 (2010) 1707-1715. J. Eur. Ceram. Soc. 30 (2010) 605-611. J. Solid State Chem. 182 (2009) 3412-3415. Solid State Ionics 180 (2009) 1564-1568. Structure and Properties of Multiferroic Oxygen Hyperstoichiometric BiFe1-xMnxO3+d. Chem. Mater. 21 (2009) 5176-5186. Application of nanoindentation testing to study of the interfacial transition zone in steel fiber reinforced mortar. Cem. Concr. Res. 39 (2009) 701-715. Synthesis and characterisation of KNbO3nanorods. Cryst. Eng. Comm. 11 (2009) 1958-1963. Ceram. Int. 35 (2009) 2877-2883. High-temperature semiconducting cubic phase of BiFe0.7Mn0.3O3+d. Phys. Rev. B 79 (2009) 214113. Encycl. Electrochem. Power Sources (2009) 188-195. J. Europ. Ceram. Soc. 29 (2009) 2823-2830. J. Am. Ceram. Soc. 92 (2009) 1296. J. Eur. Ceram. Soc. 29 (2009) 2575-2579. Cryst. Growth Des. 9 (2009) 1979-1984. Acta Cryst. C65 (2009) i11-i13. J. Am. Ceram. Soc. 92 (2009) 623-630. J. Am. Ceram. Soc. 92 (2009) 732-737. J. Power Sources 188 (2009) 106-113. Chem. Mater. 21 (2009) 169-173. J. Nanosci. & Nanotechnol. 9 (2009) 1465-1469. J. Eur. Ceram. Soc. 29 (2009) 931-935. Phys. Chem. Chem. Phys. 10 (2008) 6544-6552. J. Solid State Chem. 181 (2008) 2580-2585. Adv. Mater. 20 (2008) 3692-3696. J. Phys. : Conf. Ser. 126 (2008) 012010. Chem. Mater. 20 (2008) 5434-5437. Comput. Mater. Sci. 43 (2008) 440-449. J. Eur. Ceram. Soc. 28 (2008) 3155–3164. J. Phys. Chem. Solids 69 (2008) 2433-2439. Phil. Mag. 88 (2008) 1187-1208. J. Nanosci. & Nanotechol. 8  (2008) 685-688. Solid State Ionics 179 (2008) 1146-1150. Inorg. Chem. 47 (2008) 3173-3181. Solid State Ionics 179 (2008) 1061-1065. Solid State Ionics 178 (2008) 1787-1791. J. Membr. Sci. 13 (2008) 401-458. J. Am. Ceram. Soc. 91 (2008) 879-886. Ind. Eng. Chem. Res. 47 (2008) 434-442. Adv. Mater. 19 (2007) 4399-4403. Adv. Funct. Mater. 17  (2007) 2564-2571. Chem. Mater. 19 (2007) 6478-6484. J. Am. Ceram. Soc. 90  (2007) 3589-3595. J. Am. Ceram. Soc. 90  (2007) 3395-3400. J. Am. Ceram. Soc. 90  (2007) 3430-3434. J. Eur. Ceram. Soc. 27  (2007) 4461-4471. Ceram. Int. 33  (2007) 1603-1610. Solid State Ionics 178 [13-14] (2007) 907-914. J. Solid State Chem. 180  (2007) 2808-2815. R. Søndenå, S. Stølen, P. Ravindran , T.Grande. Phys. Rev. B 75  (2007) 214307. J. Mater. Sci. 42  (2007) 6267-6273. J. Am. Ceram. Soc. 90  (2007) 2649-2652. J. Eur. Ceram. Soc. 27 (2007) 4509-4514. Solid State Ionics 178 (2007) 593-599. Phys. Rev. B 75  (2007) 184105. J. Nanosci. & Nanotechnol. 7  (2007) 2538-2541. Chem. Mater. 19 (2007) 2213-2221. Ann. Chim. Sci. Mat. 32(2) (2007) 197-212. Stability of SrFeO3-based materials in H2O/CO2-containing atmospheres at high temperatures and pressures. J. Am. Ceram. Soc. 90  (2007) 2226-2230. Solid State Ionics 178 [11-12] (2007) 817-826. J. Am. Ceram. Soc. 90  (2007) 1339-1341. J. Sol-Gel Sci. Technol. 41  (2007) 291-298. Faraday Discuss. 134 (2007) 181-194. J. Phys. Chem. C 111 (2007) 813-822. J. Phys. Chem. B 111 (2007) 2299-2308. J. of Nanomaterials (2006) Article ID 49283 1-7. J. Am. Ceram. Soc. 89 (9) (2006) 2895-2898. J. Eur. Ceram Soc. 26 (2006) 3665-3673. Phys. Rev. B 74 (2006) 144102. Solid State Ionics 177 (2006) 1587-1590. Solid State Ionics 177 (2006) 1795-1798. Chem. Mater. 18 (2006) 6047-6053. Chem. Mater. 18 (2006) 6037-6046. E. Ochoa-Fernandez, M. Ronning, T. Grande, D. Chen. Chem. Mater. 18 (6) (2006) 1383-1385. J. Solid State Electrochem. 10 (2006) 562-568. JOM 58 (2) (2006) 58-61. J. Solid State Electrochem. 10 (8) (2006) 635-642. Acta Mater. 54 (10) (2006) 2615-2624. Chem. Mater. 18 (6) (2006) 1680-1687. Proc. 26th Risø Intern. Symp. on Mater. Sci., Risø National Laboratory Roskilde, Denmark, 2005, p.297-304. J. Am. Ceram. Soc. 88 (7) (2005) 1988-1991. Solid State Ionics 176 (2005) 2783-2790. J. Eur. Ceram. Soc. 25 (6) (2005) 927-933. J. Am. Ceram. Soc. 88 (3) (2005) 726-730. E. Bakken, J. Boerio-Goates, T. Grande, B. Hovde, T. Norby, L. Rørmark, R. Stevens and S. Stølen. Solid State ionics 176 (29-30) (2005) 2261-2267. J. Sol-Gel Sci. Technol. 35 (2005) 143-150. Ceram. Int. 31 (4) (2005) 591-598. Philosophical Transactions of the Royal Society of London Series A-Mathematical physical and engineering sciences 363 (1827) (2005) 525-533. Stabilization of Silica Sols Derived from an Inexpensive, Fully Inorganic Precursor and Their Use. J. Non-Cryst. Solids 342 (2004) 59-64. Improvement of the Silica Aerogel Strengthening Process for Scaling-up Monolithic Tile Production. J. Non-Cryst. Solids 350 (2004) 196-201. LaFeO3 and LaCoO3 Based Perovskites: Preparation and Properties of Dense Oxygen Permeable Membranes. Mixed Ionic Electronic Conducting Perovskites for Advanced Energy Systems (2004) 75-85. Mass Transport in La1-xSrxFeO3(x=0 and 0.1) Measured by SIMS. Solid State Ionics 175 (2004) 69-71. Phase Diagram from Computer Simulation. Phys. Rev. E 70 (2004) 061507. Phase Equilibria in the Pseudo-binary System SrO-Fe2O3. J. Solid State Chem. 177 (2004) 2933-2942. Crystal Structure and Thermal Expansion of La1-xSrxFeO3-d Materials. J. Am. Ceram. Soc. 87 (2004) 1952-1958. HRTEM Investigations of New AlN Polytypoids in the High AlN Region of the AlN-Al2O3-Y2O3 System. J. Am. Ceram. Soc. 87 (2004) 275-278. Preparation and Characterization of Aluminium Nitride - Titanium Nitride Composites. J. Europ. Cer. Soc. 24 (2004) 2169-2179. Phase Relations and Microstructural Development of Aluminium Nitride-Aluminium Nitride Polytypoid Composites in the Aluminium Nitride-Alumina-Yttria System. J. Am. Ceram. Soc. 87 (2004) 1734-1740. Preparation and Characterisation of Aluminium Nitride-Silicon Carbide Composites. Ceram. Int. 30 (2004) 931-938. Preparation and Properties of Porous Aluminium Nitride-Silicon Carbide Composite Ceramics. J. Am. Ceram. Soc. 87 (2004) 1200-1204. Combustion Synthesis and Characterization of Nanocrystalline CeO2-Based Powders. Chem. Mater. 16 (2004) 5489-5494. Ceramic Properties of Pugu Kaolin Clays. Part II: Effect of Phase Composition on Flexural Strength. Bull. Chem. Soc. Ethiop. 18 (2004) 7 - 16. John Wiley & Sons (2003) 370 pages. Ceramic Properties of Pugu Kaolin Clays. Part I: Porosity and Modulus of Rupture. Bull. Chem. Soc. Ethiop. 17 (2003) 147-155. Electronic Conductivity and the Effect of Schottky Disorder in LaFeO3-d. Proceedings of COST-525, London: Materials science book, Maney publishing (2003) 19-25. High Temperature Transport Kinetics in Hetero-epitaxial LaFeO3 Thin Films. Solid-State Electronics 47 (2003) 2279-2282. J. Sol-Gel Science and Technol. 26 (2003) 1239-1242. Key Eng. Mater. 206-2 (2002) 1221-1222. Microsc. Microanal., 8 (2002) 1428CD. Physica A 314 (2002) 560-566. Phys. Chem. Chem. Phys. 4 (2002) 3396-3399. Solid State Ionics, 152-153 (2002) 675-80. J. Mater. Chem., 12 (2002), 1058-1067. J. Solid State Chem., 163 (2002) 186-193. Key Eng. Mater. 206-213 (2002) 1153-56. J. Eur. Cer. Soc., 22 (2002) 247-252. J. Metals 63 (2002) 46-54. J. Am. Ceam. Soc. 85 (2002) 2971-2976. The 20th Inter. Course on Process Metallurgy of Aluminium, May 28. - June 1. 2001, Trondheim, Norway. Microsc. Microanal. 7 (2001) 1124-1125. Chem. Mater. 13 (2001) 4005-4013. Solid State Ionics, 143 (2001), 367-377. Electronic conductivity and the effect of Schottky disorder. Proceedings of COST-525, Working group meeting. (Advanced Electroceramics: Grain Boundary Engineering). Aveiro, Portugal 20-24 October 2001. Chem. Mater., 13 (2001) 723-32. J. Non-Cryst. Solids, 296 (2001) 165-171. J. Non-Cryst. Solids, 285 (2001) 1-7. Solid State Com. 115 (2000) 249-252. J. Solid State Chem. 150 (2000) 121-127. Microsc. Microanal. 6 (2000) 422. Solid State Ionics, 135 (1-4), (2000), 713-717. Catalysis Today, 56 (2000) 283-295. J. Am. Cer. Soc., 83 (2000) 2318-2320. J. Am. Ceram. Soc, 83 (2000) 3158-64. J. Mater. Sci. Lett., 19 (2000) 1379-1381. J. Korean Cer. Soc., 6  (2000) 37-42. Invited paper. J. Mater. Sci., 35 (2000) 4251-4260. J. Europ. Cer. Soc., 20 (2000) 51-56. J. Europ. Cer. Soc., 20 (2000) 185-193. J. Mat. Sci, 34 (1999) 5811-5819. J. Am. Ceram. Soc. 82 (1999) 729-734. J. Eur. Cer. Soc., 19 (1999) 389-397. J. Am. Ceram. Soc. 82 (1999) 721-728. J. Mat. Sci., 34 (1999) 957-966. J. Solid State Chem. 145 (1999) 253-259. J. Solid State Chem. 145 (1999) 167-173. J. Chem. Thermodynamics 31 (1999) 465-477. J. Phase Equilibria 20 (1999) 1-10. J. Am. Ceram. Soc. 82 (1999) 2538-44. J. Am. Ceram. Soc. 82 (1999) 190-96. Proc. 41. Inter. Feurfest-Kolloquium, Aachen, Germany, September 1998, p. 54-58. Solar Energy Materials and Solar Cells, 54 (1998) 181-188. Chem. Papers 52 (1998) 21-28. Proceedings from The International Terje Østvold Symposium, Røros, Nov. 2-3, (1998), pp. 43-48. J. Solid State Chem. 141 (1998) 248-54. J. Solid State Chem. 140 (1998) 248-54.
in Advanced Multilayered and Fibre-reinforced Composites, Ed. Y. Haddad, Kluwer Academic Publ., (1998) 285-295. Physical Review E, 57 (1998) 6767-73. J. Non-Cryst. Solids 225 (1998), 298-302. J. Non-Cryst. Solids 225 (1998), 1-7. Invited paper. J. Sol-Gel Sci. Techn. 13 (1998) 317-322. J. Non-Cryst. Solids, 226 (1998) 122-128. J. Non-Cryst. Solids, 231 (1998) 10-16. Key Eng. Mater. 132-136 (1997) 1377-80. Euro-Ceramics V, Key Engineering Materials 132-136 (1997) 2017-2020. J. Am. Cer. Soc., 80 (1997) 1047-52. J. Am. Cer. Soc. 80 (1997) 3013-20. J. Europ. Cer. Soc. 17 (1997) 873-878. J. Non-Cryst. Solids, 221 (1997) 135-143. J. Non-Cryst. Solids 211 (1997) 49-55. J. Crystal Growth, 182 (1997) 363-374. J. Non-Cryst. Solids, 215 (1997) 169-175. J. Sol-Gel Sci. Techn. 8 (1997) 153-157. Ber. Bundsenges. Phys. Chem. 101 (1997) 1291-96. Phys. Chem. Glasses 38 (1997) 327-34. J. Phys. Condens Matter. 9 (1997) L247-49. J. Non-Cryst. Solids, 213&214 (1997) 341-344. J. Am. Ceram. Soc., 80 (1997) 1405-15. Phys. Chem. Glasses, 38 (1997) 277-81. Ber. Bundsenges. Phys. Chem. 100 (1996) 1617-20. Ber. Bundsenges. Phys. Chem. 100 (1996) 1588-92. J. Am. Ceram. Soc. 79 (1996) 2205-6. Phys. Chem. Glasses 37 (6) (1996) 239-247. Ber. Bundsenges. Phys. Chem. 100 (1996) 1953-6. J. Phys. Chem., 100 (1996) 5457-5463. J. Non-Cryst. Solids 195 (1996) 180-87. Proceedings International Symposium on Optical Materials Technolgy for Energy Efficiency and Solar Energy Conversion, SPIE-TI8, Freiburg, Germany, Sept. 1996, pp. 191-196. J. Non-Cryst. Solids 204 (1996) 228-234. J. Porous Materials, 2 (1996) 315-324. Invited paper. J. Europ. Cer. Soc., 16 (1996) 899-906. J. Non-Cryst. Solids, 202 (1996) 42-52. Thermchimica Acta 256 (1995) 33-46. J. Non-Cryst. Solids 184 (1992) 114-118. J. Non-Cryst. Solids 184 (1995) 297-301. J. Non-Cryst. Solids, 185 (1995) 221-226. Comp. Mat. Sci. 4 (1995) 373-82. Phys. Rev. Lett. 73 (1994) 1632-35. J. Sol-Gel Sci. Tech., 3 (1994), 199-204. Trans. Mat. Res. Soc. Jpn. 14A (1994) 837-840. J. Sol-Gel Sci. Tech., 2 (1994), 903-906. J. Non-Cryst. Solids 161 (1993) 177-181. J. Non-Cryst. Solids 161 (1993) 86-90. J. Non-Cryst. Solids 161 (1993) 152-56. Solid State Ionics 65 (3-4) (1993) 86-90. J. Am. Ceram. Soc., 76 (1993) 1624-26. Int. J. Thermophys. 14 (1993) 777-794. J. Non-Cryst. Solids 140 (1992) 69-72. J. Non-Cryst. Solids 140 (1992) 73-76.
in Eurogel ´91, S. Vilminot, R. Nass and H. Schmidt, eds., Elsevier, 1992, pp. 425-430.
in "Chemical Processing of Advanced Materials", L.L. Hench and J.K. West, eds., Wiley, New York, 1992, pp. 355-361. Metallurgial Transactions B - Process Metallurgy 22 (6) (1991) 831-837. Electron Microscopy and Analysis: Inst. Phys. Conf. Series. 119 (1991) 295-298. J. of Mater. Sci. Lett., 9 (1990) 1389-1391. Scand. J. Metall. 19 (1990) 64-71. Vibr. Spectr. 1 (1990) 61-68. Physica C 162 (1989) 546-547. Microchim. Acta 2 (1988) 381-383. Microchim. Acta 2 (1988) 307-309. Solid State Commun. 167 (1988) 525-527. Physica C 153 (1988) 828-829. Physica C 153 (1988) 1026-1027. Mater. Sci Forum 32 (1988) 543-648. J. Electrochem Soc. 134 (1987) C510. Z. Naturforsch. 42 (1987) 463-470. Spectrochimica Acta, 42a (1986) 1317-1322. Z. Naturforsch., 41a (1986) 615-618. Geochim. Cosmochim. Acta 50 (1986) 1201-1204. "Workshop on Functional Biomedical Materials"
This workshop is dedicated to piezoelectric materials and their application in the biomedical area. The unique characteristic of piezoelectric materials to transform a mechanical load into an electric signal as well as an electric stimulus into a mechanical displacement, are of great interest for sensing, energy harvesting and cell sensing devices, both in vivo as implants and ex vivo in lab on chip applications. The physiological boundary conditions the piezoelectric materials are subjected to in these applications are different to the ones they commonly observe, e.g. in sensing and actuating in the automotive or communication industries. The mechanisms of piezoelectric functionality and reliability have to be re-thought to make the functionality of piezoelectric materials accessible for biomedical application. The intention of the workshop is to bring together experts from different areas of science to discuss the latest research in the field within the broader context of developing functional materials for biomedical technology. The topics will span from materials chemistry and physics, bioengineering and medicine towards humanities. With this workshop, we aim to encourage lively discussions about how targeted materials development that meets clinical as well as ethical and social requirements can be realized already in the early stages of lab-bench research. Open positions (PhD and post doc.) will be posted here. PhD scholarship available: combined computational and experimental work on solid state electrolytes for Li ion batteries. 4-year position with teaching duties in NTNU Nanolab. The PhD admission requirements for admission to PhD program can be found here. Follow our activites on our Facebook page. Specialization and Master projects offered in the FACET group for Fall 2019 and Spring 2020 can be found here. Professor Dennis Meier revived the “Fridtjof Nansens belønning for yngre forskere” (award for young scientists) for 2019 from Det Norske Videnskaps-Akademi (Norwegian Academy of Science and Letters). He received the award for his outstanding work in material physics. Professor Dennis Meier received the I.K. Lykke prize for exceptional young researchers within the field of sciences from the Royal Norwegian Society of Sciences and Letters (Det Kongelige Norske Videnskabers Selskab, DKNVS). Sandra Helen Skjærvø was awarded the price for best PhD thesis 2018 at the Faculty of Natural Sciences (NTNU) for her work on Structural and chemical stability of hexagonal manganites! Professor Mari-Ann Einarsrud received the “Årets Foreleser” award for providing outstanding lectures in her courses in 2018. Assoc. Prof Hilde Lea Lein is one of nine professor that received a recognition of their pedagogical competence from NTNU. Outstanding Academic Fellow programme (Stjerneprogrammet): Three of our group member have been selcted by NTNU for this program: Julia Glaum, Sondre Kvalvåg Schnell and Dennis Meier. Gustav-Herz-Preis: Assoc. Prof. Dennis Meier was awarded the highly prestigious price for 2017. K.-N. Pham et.al. Epitaxial K0.5Na0.5NbO3 thin films by aqueous chemical solution deposition, R. Soc. Open Sci. 6 (2019) 180989. T. Brandvik et.al. In Situ Monitoring of Pit Gas Composition During Baking of Anodes for Aluminum Electrolysis, Metall. Mater. Trans. B (2019). M. Bittner et.al. A comprehensive study on improved power materials for high-temperature thermoelectric generators, J. Power Sources 410–411 (2019) 143–151. Two of our amazing PhD Candidates participated in this years edition of the research dissemination competition PhD Grand Prix, arranged by chemical students at the NV faculty. Frida Paulsen Danmo won first place, while Vilde Bråten placed third. Professor Mari-Ann Einarsrud received the “Årets Foreleser” award for providing outstanding lectures in her courses in 2018. “Årets Foreleser” (Eng: “Lecturer of the year”) is the annual prize awarded by the chemical engineering students, (through the student organization Høiskolens Chemikerforening) at NTNU, to lecturers that have shown extraordinary scientific and pedagogic qualities. The jury chose Mari-Ann Einarsrud for her ability to explain complex topics in a structured and understandable way using visual aids and demonstrations, and for the way she is encouraging students to participate and ask questions which stimulates learning. More group news can be found here.